TOKYO -- Is this a good or bad omen for Nissan's new Leaf electric vehicle? As part of an optional support package for Japanese customers, Nissan is offering towing to the nearest dealership should the Leaf's battery run dry and, uh, leaf them stranded. On one hand, the service combats so-called range anxiety -- the fear you might not make it home. On the other, it must make nervous customers wonder: Just how often am I going to need a tow? Wrecker retrieval is just one part of the Nissan Zero Emissions Support Program. 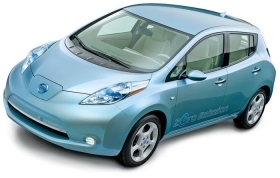 The program will be offered first in Japan, where the Leaf goes on sale this year. But Nissan says it is considering similar support programs in other markets, including the United States. -- Unlimited free battery recharging at Nissan dealerships. -- 24-hour emergency operator service. -- A 50 percent discount on rental cars when a bigger or longer-range vehicle is needed. Under the plan, Nissan also will cover up to ¥550,000 ($6,599) in roadside emergency expenses associated with battery problems, including the towing fees. Remote computer support is another feature. Leaf drivers can monitor and control battery recharging and operate air conditioning and heating remotely through smart phones and computers. This will let them heat or cool their cars while they are plugged in to an electricity source instead of drawing upon the batteries' limited supply of power. At least one of the precious-few preproduction Leafs already needed towing recently -- but not because the battery gave out. During a July test drive event for Japanese media, one reporter accidentally punched the demo vehicle through a fence, smashing its nose, according to the Japanese magazine Shukan Bunshun. No one was hurt, but the event had to be scrubbed. The test car's license plate, Shukan Bunshun noted, was 5523. When said aloud in Japanese, the numbers read "go-go-ni-san," a not-so-subtle play on the cheer "Go! Go! Nissan!"